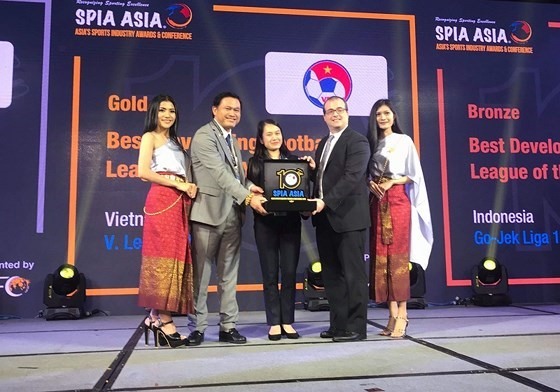 Việt Nam’s V.League won the “Best Developing League of the Year” award from Asia’s Sports Industry Awards and Conference (SPIA Asia) at a meeting in Bangkok, Thailand, on Tuesday. The Southeast Asian league overcame nine entries to take the title, which is managed exclusively by the Asian Football Confederation (AFC) and evaluated against AFC catalogue of standards for professional leagues under the confederation’s criteria. The Indian I-League came second and the Indonesian Go-Jek Liga 1 was third. “Best Developing League of the Year” was open to professional leagues which had one automatic slot for participating in the AFC Cup or which did or did not participate in the AFC Cup qualifiers during the 2017-18 season under the AFC Club Competition Ranking for AFC Member Associations. Nominees in this category have been initially screened and assessed through 11 categories such as management and administration, financial performance, competition, marketing and promotion, and media and communications. This is the first continental award won by V.League in its 18 seasons. Hà Nội FC won the league trophy in 2018. Other awards presented in Bangkok were Best Sports Digital Platform, Best Integrated Marketing Campaign for Sports Event and Best Sports Tourism Destination.